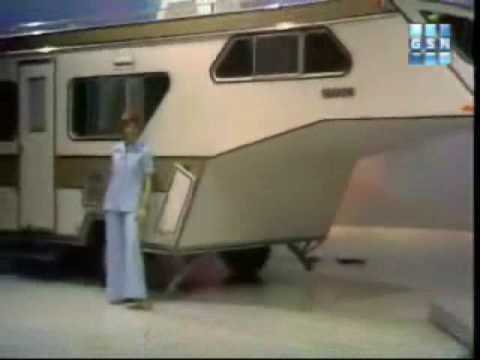 The clip shows a caravan design that hitches to the roof of a car for towing. The towbar appears to be mounted in a similar way to a roof rack and the front end of the van is designed to sit over the top of the car body. The VW Beetle used in the clip is small enough to sit under the van facing in any direction and the unusual hitching mechanism provides an extremely tight turning circle. We can’t even begin to imagine how such a get-up would affect handling at speed and the roof-mounted towbar looks like it would play havoc with the car’s handling — let the alone structural integrity of the roof. There’s no other information about the source of the clip or details of the van it shows, but there is another video from a 1970s’ US game show that shows something similar. Let us know in the comments if you recognise either van design, or can chip in about their practicality — and safety.